TwoSeven: I was having an issue accessing international sites the last day or so. I notice at the moment that my connection is running at 119Mbs/10Mbs 25ping - usually I am lucky if I get anywhere near 30Mbs down. 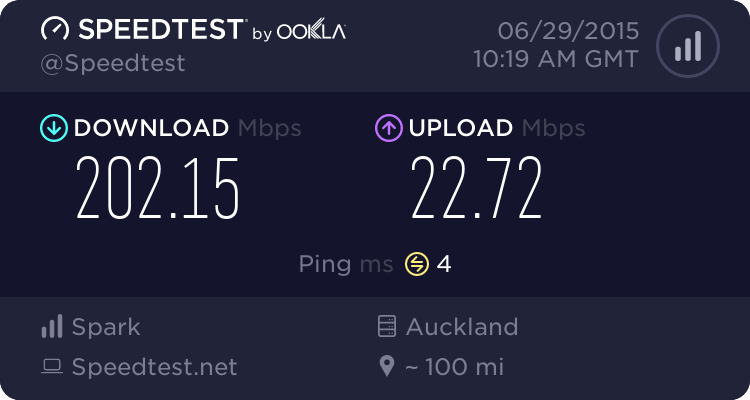 Normally I use both the telstraclear/Vodafone speedtest to check my on-net speed (which always gives me a large number) and then I use an off-net speedtest to give me a 'real-word' value. I was aiming for a 'real-world' value when I last checked, but I have my suspicions that the server I selected might have been on-net. Will try again later to see if that was the case. I'm going to pump this again with the same issue. Really high ping to Australia. 15 171 ms 171 ms 171 ms i-0-4-0-9.paix-core01.bi.telstraglobal.net [202. 16 325 ms 327 ms 326 ms i-0-7-0-0.sydo-core01.bx.telstraglobal.net [202. 18 325 ms 327 ms 327 ms bundle-ether1.chw-core2.sydney.telstra.net [203. However whats weird is that all the CDN and DNS servers are just instant working instead of taking forever when the ping goes down. Something really really weird going on? Issue has seemed to of cleared. Still wondering what the heck happened.